The Blank Check Templates below are free to download and insert your organization or church's name, address and phone plus your bank account information to print for your church office. Magnetic Ink - The entire check does not need it but I recommend using it on the bank information such as the routing number and account number. Security Paper -This is a special paper used for check printing with special features to make it difficult to alter your printed check and your account will be safer. Fill Out Basic Personal Information - Some checkbooks include this information on their deposit slips but the any other you will need to include at least your name, account number and date. On the deposit slip template below you can insert this information and more into the template and then print so you will not have to print this information every deposit. Fill in Basic Deposit (Cash, Checks...) Information - List any checks to deposit where it lists "Check Number" and "Amount" and then insert total of checks on "Totals" line. List any and all coins by putting the number of coins to the right of specific coin and to the right of that include the total and then below pennies is "Total" and this is where you put total coins. Do the same steps with the cash bills, and on the bottom line stating "Total Cash" put the total of coins and cash bills together. Fill in Total Deposit - The last line under the total checks is where you will put the total of the entire deposit (Total Cash Bills and Coins plus Total Checks). Do you always run out of deposit slips before your new checks come in the mail? If yes, then download the deposit slip form template below and you will never be run out again as long as you have your PC and printer available. You can save time and errors by using the deposit in MS Excel format that auto-calculates the monies to ensure accuracy and a great outcome. You can fill out your deposit slips straight from your church office PC and let it do all the thinking for you. If you use the handwritten deposit slips to make your deposits, then you have to always be sure to enter the deposits correctly so that your bank account will balance properly. 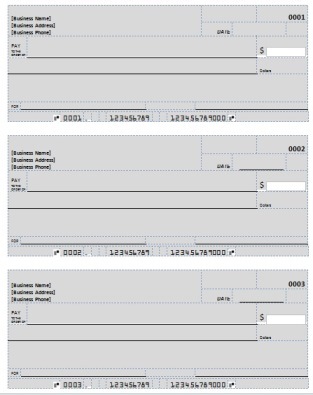 You can purchase blank check paper (8"x11") to print your blank checks on or use what kind of paper you prefer to use. The business check template below can be customized to fit your organization's needs. There are three checks to each sheet of paper. Return to Financial Forms from the Blank Check Template & Deposit Form Template.